In June 1961, the Department of Fisheries mounted a .50 caliber machine-gun overlooking Seymour Narrows, northwest of Campbell River, with the intent to shoot and kill passing orcas. Deemed a threat to commercial and recreational fishing, killer whales were known in the Pacific Northwest as, at best, dangerous pests or, at worst, menacing monsters that could easily maim humans. 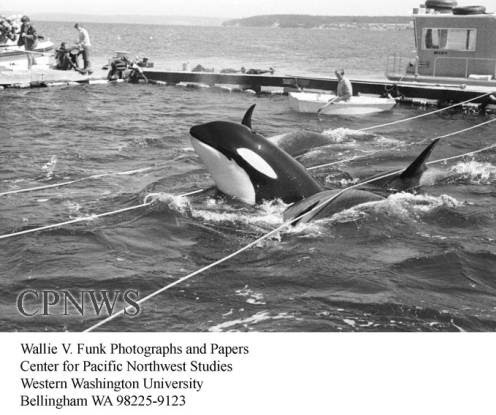 Although the Department of Fisheries never used the machine-gun and removed it only months later, beliefs that killer whales were dangerous monsters persisted. Today, killer whales are seen as noble icons of our need to protect the ocean, charismatic pandas of the sea, and a critically important species in the marine ecosystem. What changed in the years following the machine-gun removal? What caused the relationship between humans and orcas in the Pacific Northwest to change? The change in public sentiment towards orcas can be traced to 1964 when Dr. Murray Newman of the Vancouver Public Aquarium commissioned a life-size model of a killer whale. Believing that capturing and displaying a live killer whale would be dangerous and almost impossible, Newman saw a sculpture as a way to introduce aquarium visitors to the species. 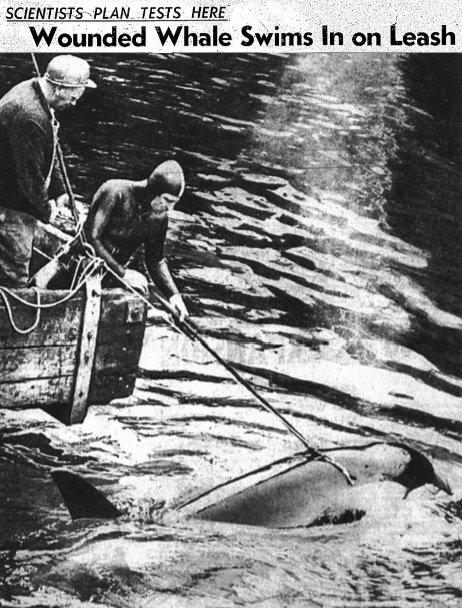 With sculptors needing a specimen, meaning a dead killer whale to study, Newman sent Sam Burich and Ronald Sparrow to Saturna Island to harpoon a whale. Although killer whales were seen most summer days around Saturna Island, two months went by in the summer of 1964 without a sighting. By mid-summer, Sparrow returned home to work on his fishing boat and Burich was joined by fisherman Joe Bauer. On July 16, Burich and Bauer woke to the sounds of killer whales passing by their tents and rushed to their harpoon. Moments later, a young whale was struck just behind its blowhole and, to the surprise of Burich, Bauer and onlookers, survived. With the whale injured but alive and tethered, Newman made the decision to tow the animal back to Vancouver and keep it at Burrard Dry Dock. Early statements made by the Aquarium focused on the scientific value the whale held, not the commercial or public appeal. The whale’s popularity was undeniable however, when over 20,000 spectators came to see it the day the dry dock opened to the public. Within days of the capture, newspapers around the world reported on the whale’s surprising “docile obedience,” “meek” behaviour, and overall gentleness. Eventually named “Moby Doll,” the whale’s capture not only transformed how the public perceived killer whales, but also revealed how little was known about the species. Aquarium personnel, for example, offered Moby Doll dead salmon and horse meat to eat before the whale finally accepted a live flounder after six days in captivity. At this time, there was no knowledge or understanding of eco-types or varying diets, instead all killer whales were believed to eat fish, seals, and other whales. Researchers also struggled to determine Moby Doll’s gender, deciding the whale’s small size and calm behaviour meant it must be a female, when it reality, Moby Doll was a young male. With so little known about even the basic physiology of killer whales, it comes as no surprise that there was little consideration about the emotional intelligence or cognitive abilities of Moby Doll and other whales. In the years following Moby Doll’s capture, aquariums in Canada, the United States, and others around the world displayed killer whales. Among them, Seattle Aquarium had Namu, a Northern Resident killer whale, SeaWorld displayed Shamu, a Southern Resident killer whale, and Sealand of the Pacific in Victoria displayed both transient and resident killer whales together—not knowing they did not live together, share a diet, or communicate, in the wild. In the 1970s, however, changes in public sentiment towards whales, whaling, and captivity were taking place. Spurred by aquariums that portrayed whales as charming, playful, and friendly creatures, whales and dolphins quickly became an icon of healthy ocean ecosystems among environmentalists, animal activists, and those who fell in love with the animals through aquariums or wild interactions. As both scientists and audiences interacted more with these marine mammals, they gained understanding not only of the species’ intelligence, but also their capabilities for familial bonding and emotional intelligence. By the mid-1970s, Greenpeace had started its Save-the-Whales movement—a crusade against whaling. It was also when Dr. Michael Biggs discovered that there were roughly only 350 killer whales in the Pacific Northwest. On October 21, 1972, the US government implemented the Marine Mammal Protection Act (MMPA), making it illegal to kill, capture, or harass marine mammals in US waters, without special permits. Following the MMPA, the U.S. government granted several marine parks permits to continue capturing whales and dolphins, but by 1976 oceanariums had moved their operations out of the Pacific coast. Canada does not have an act equivalent to the MMPA, instead, a series of marine mammal protections are incorporated in the 1993 Marine Mammal Regulations under the Fisheries Act with. Whale and dolphin captivity persists and, to some extent, continues to inspire future marine mammalogists while generating interest in and empathy for the captive animals among audiences. Meanwhile, anti-captivity movements emphasize the need to move beyond confinement and to treat marine mammals with empathy and respect. They advocate for a banning of captivity and breeding programs, and encourage the reintroduction of live-captured whales into sea-pens. Furthermore, many organizations, including Georgia Strait Alliance, advocate for increased protection of wild killer whales by protecting their habitat and reducing threats to their survival and recovery, such as low prey population, noise pollution, and ocean pollution. It is important to reflect on how our relationship with killers whales has evolved over time to understand where threats to the species originated, what steps are being taken to protect the species, and how other people have or continue to think of killer whales. 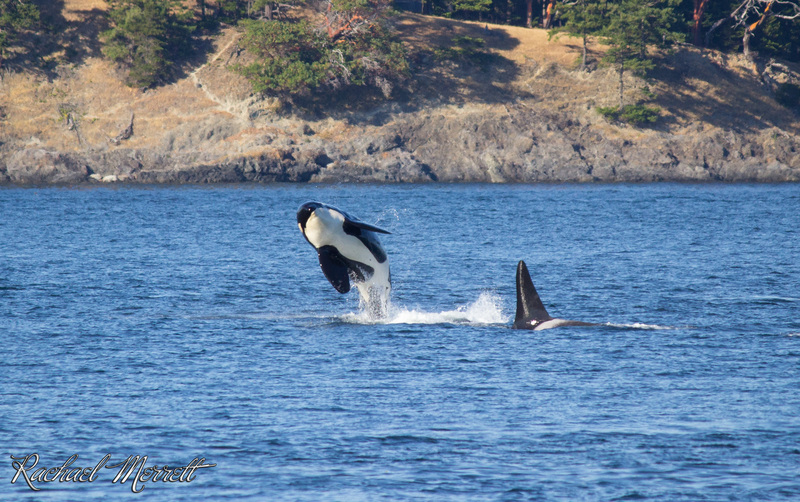 Many Coastal First Nations, for example, have a long and enduring relationship with killer whales, incorporating these animals into symbols, storytelling, spirituality, and other aspects of culture. Today, Southern Resident killer whales are critically endangered, but by understanding our changing relationship with orcas, we can take steps to ensure they survive. Join the Orca Action Team and be part of the movement that we are creating together. If you’re in the Victoria area, come out to our Pods & Pottery Event on June 24th and learn more about these incredible animals!